We definitely will get some casts out this year. We are midway through quite a lot of construction work to expand our manufacturing capacity. It should be complete by mid May, so we should be in a better position to announce any availability then. I'm not really much of a painter, but I finally got my Dindrenzi's painted. Loads of reasons Look we understand it is easy to post a remark to say these should all be in production right away. But there are lots of reasons for not just pouring resin into some of the molds and selling it. Amongst others: We want products we sell to be of a high quality. Some of the molds and masters are simply not present. There is a significant outlay involved in remastering and remolding items, and that doesn't include packaging. If an item is only going to sell a handful it isn't worth the time and effort. We have a significant amount of construction taking place between March and April which will quadruple the size of our manufacturing facility. While it is going on it will have an impact We do not want to follow a direct only model. It alienates retailers and partners. I am very happy to have DW coming back -- and based on the WWX rules, I am excited to see what Warcradle comes up with. 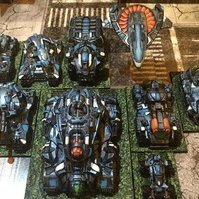 That being said Storminwolf, the issue I have is having bought into the game rather heavily and being left with obsolete models. I will not spread negativity and I will of course wait and see how the new scale affects the old scale. If worse comes to worse, I'll just play the new rules with the old minis. Cheers! Yeah, good point. That scene was one of my favorites in the movie. Forcing a ship to change its heading would lead to some interesting activation's. This is true, assuming that you were the victor. Otherwise you'll be lucky to spend the rest of the war in a POW camp. A campaign system really would be helpful here. We've been using the following house rule for seriously damaged ships: Adds a bit of tension when your lead cruiser has to make a hasty exit. It is 187X, a generation since the end of the American Civil War. The greatest scientific minds of the age have unlocked secrets that the human race was unprepared for. Now mighty empires clash as super science and alien technologies bring the world perilously close to annihilation. THE DIE IS CAST An ancient entity known as the Hex has been subtly influencing humanity for thousands of years for its own purposes. This interference has attracted other alien forces to take an interest in humanity and their technology has fallen into the hands of an alliance of scientists known as the Covenant of the Enlightened. Combining the newly discovered Element 270 with a limitless power source known as RJ-1027, the Enlightened have ushered in an age of phenomenal scientific advancement in areas that were the stuff of dreams only decades before. This unearned and disjointed scientific progression has, however, come with neither morals nor safeguards and the world has been plunged into a Dystopian Age. Through manipulation, fear or conquest, many nations of the world have formed alliances with mutual economic and defensive benefits, often around common cultural or geographic ties. The remaining great industrialized nations of the world, while powerful in their own right, found that they were over-matched and driven to join larger alliances until, as the end of the century draws near, seven distinct power blocs have emerged. These seven great powers appear evenly matched in their war-making potential and this brings a grim prospect: If a total global war were to erupt there would likely be no clear victor. As the world teeters on the edge of such a globally catastrophic world war, the great powers battle tirelessly to gain a decisive advantage and emerge triumphant with a mix of military, subterfuge, diplomacy and economics. THE CARIBBEAN HURRICANE Despite the best of intentions and most meticulous of strategies, events can quickly spiral out of control. Barely two years after its brutal Civil War, the Union entered the world stage and ended up in a three-way running battle with their old adversaries the British Crown and an unfortunate first contact with the Celestial Empire. In an attempt to seize the valuable Element 270 deposits found in the waters nearby, the Japanese fleet, commanded by Admiral Hariken, had overwhelmed the Crown garrison at the Falkland Islands. Such was the swiftness and totality of Admiral Hariken's victory that she ordered her forces to push northwards along the South American coast for an audacious assault on the Crown's Caribbean holdings. The Caribbean was regarded as neutral territory by both the Crown and Union, so the buildup of a retaliatory Crown fleet near Bermuda was interpreted as a breach of the region's neutrality by the Americans. In what became known as the Caribbean Hurricane, after the ambitious Japanese Admiral, President Johnson dispatched a taskforce of armoured paddle-steamers from New York to contest the Crown forces massing in the Caribbean. It was a proud moment for the Union as its forces, once riven by internal conflict, came together for the greater glory of their new nation. What the Union found there was a meat-grinder. Entire island chains were engulfed by the running battle between the Crown fleet and the invading Celestial Empire who did not expect them to be present in quite such force. The Union ploughed in between them and engaged both sides with the full fury of the Federated States. The islands of Cuba and Puerto Rico became shattered battlegrounds, torn by massive war engines, columns of tanks and fierce aerial bombardments. When the Celestial ships withdrew the Dragon had learned a valuable lesson that day not to underestimate either the old Lion or the young Eagle. The Crown permitted the Union to establish facilities throughout the Carribean to help regenerate the shattered communities. Of course, when the Union then annexed the territory in 1873, it was the cause of another pitched battle which this time saw the Union forces withdraw and the Crown exert control over the islands. That, however, is another incident. Within each of the great power blocs, there are a number of proud and distinctive nations in possession of their own traditions, culture and politics. Tensions and infighting cause paralysis at times for each of the seven powers and these are seized upon by their rivals as opportunities for advancing their own agendas. Such conflict between allies is regrettable but, unfortunately in the Dystopian Age, unavoidable. THE SINGAPORE INCIDENT The world came perilously close to world war once more after an internal trade dispute in South East Asia with Britain and the Raj. The disagreement drew in the Celestial Empire and finally, in the summer of 1869, the whole region exploded into violence. Known as the Singapore Incident, the city burned beneath the fury of the Empire's cannons and rockets. Even as the proud trading hub collapsed in flames, a fleet of mighty Crown warships raised steam across Queen Victoria’s domains to inflict righteous retribution. The conflict was brief but bloody, with thousands killed as the two great naval powers clashed. While there are times of detente between them, more often than not any one of the seven powers will be involved in clashes and conflicts over resources, territory and the actions of individual commanders in the field making the right (or wrong decision). To stave off a global Armageddon, a network of ambassadors, diplomats, bannermen, marshals and emissaries can be found crisscrossing the globe attempting to smooth over the countless brutal and bloody proxy wars, sabre rattling, land grabs, insurgencies and state-sponsored terrorism that are a daily occurrence in the Dystopian Age. STORM OF STEEL Another example of these flashpoints came in 1873 when the Russian Commonwealth, its military forces mightier than ever before thanks to Markov’s betrayal of the Enlightened, clashed with the Prussian Empire over the expansion of the Polish-Lithuanian border. The Commonwealth had been invited to enter the disputed city of Krakow by the city's burgomeister in an attempt to quell the unrest fermenting on the streets. Instead, the Commonwealth came crashing into the hardened frontier fortresses of their Imperium rival. Huge Russian tunnelling engines burrowed beneath the city and burst forth beyond, allowing hordes of Russian tanks and infantry to storm key areas behind the Imperium's front-lines. A counter-offensive masterminded by General Matthias Sturm held the line for the Imperium. The iron-clad legions of Kaiser Frederick Grunder stood firm against the hammer-blow, meeting Russian and Polish-Lithuanian steel and shot with the voltaic arc of Tesla-coil born lighting storms and furious bomb barrages from the Imperium zeppelin fleets. Only the intervention of the Teutonic Knights and the eventual withdrawal of Commonwealth forces back to their agreed borders brought an end to the fighting. Now, however, talk of Krakow seceding from the Imperium threatens to reignite the conflict once more. BATTLE FOR NEW CARTHAGE Elsewhere in that same year, the Latin Alliance led by French forces mounted a full assault on western New Carthage, the North African lands until then claimed by the Ottoman Sultanate. By this means, Napoleon and his Alliance sought to expand their control of the Mediterranean. The initial Italian expeditionary force was smashed before they could cross the desert to New Carthage but the French Legions stood poised to launch themselves across the sea. Fierce armoured clashes shook the northern deserts as invading Spanish and French Land Ships battered the Sultanate forces across a veritable ocean of dust, grit and stones. At sea, the battle was no less intense as French and Portuguese raiders fought to prevent Sultanate and Enlightened reinforcements getting through. Crown assets on the island of Malta came under attack by the Sultanate and barely survived the fierce bombardment. The French assault hit the New Carthage shoreline with terrific force, driving deep inroads into Sultanate-held regions. A maelstrom of conflict raged on land, sea and air, with the French Legions eventually managing to secure a firm foothold on the North African shore. In retaliation for what happened at Malta - and sensing an opportunity while the Sultanate and Alliance forces were at each other's throats - an Indian Raj expedition advanced north into the Red Sea. Despite several assaults by Ottoman forces, the land expedition managed to strike deep into Ottoman Sudan. There, however, they were caught between two wholly unexpected foes; an aerial assault by the infamous League of Crimson and huge, spider-like Enlightened war machines, rising from the desert. Amid storms of energy beams the plucky Indian Raj forces were utterly destroyed, their passing only confirmed months later when parts of their armour appeared on the black market. FORTUNE FAVOURS THE BOLD The Dystopian Age is an era where individuals can make their mark with opportunities for personal gain as well as the national interest to defend. Whole regions have been devastated by conflict, and yet others are relatively untouched, transformed instead into hives of activity, with the massive expansion of industry and technological development to feed this terrible struggle. Worse yet, it appears that the world itself is changing as if the roiling conflict is enveloping the natural order as well as that of humankind. Bizarre weather events erupt with increasing regularity, mighty storms blow up and then suddenly vanish. At sea and in the air, ships and flying craft mysteriously vanish; only to reappear miles off course, their crews having no recollection of the missing time. There are key regions around the globe that offer the potential to grant a decisive advantage to those that dare claim it for the Dystopian Age. Many of these involve the alien or otherworldly artefacts that are being discovered. These artefacts defy explanation, which makes them only more sought after. Most notably the Enlightened has uncovered a strange structure in the Sudanese desert. Undoubtedly this is the cause of their presence in the region and the reason for their fierce resistance to the Crown's eastern expedition. Yet further east in Africa, the streets of Lagos bear witness to extraordinary masquerade scenes where fantastical performances hide the battle between the agents of the Dark Council and the Outlaw guilds for control of the city. In the American Frontier, the Lawmen and the Union army try to maintain some sense of control of the vast untamed landscape filled with the proud Warrior Nation and all manner of Outlaws, wild creatures and Enlightened experiments to contend with. There are factions at work in the wild west beyond the ken of the seven great power blocs and there is much more to be found beneath the soil than just the riches of gold. A similarly wild and dangerous place can be found half a world away in the outback of Australia. There, the Enlightened and Australian Outlaws race in sturginium and RJ fuelled battles across the lethal landscape. The aboriginal peoples there are part of the Warrior Nation and take no prisoners should these high-speed interlopers violate the sanctity of their sacred places. These are truly places where a man or woman can make their fortune and become a legend. Perhaps most important of all, however, is in far-flung Antarctica, where the Enlightened have established a fortress-city known as Well's Chasm at the entrance to the interior of that great unexplored continent - and the alien Vault that lies beneath it. The flow of time and distance itself seemed to become strangely distorted in some areas of the Antarctic. especially in the vicinity of large quantities of sturginium around the Vault which seemed to act as a catalyst for such events. Though the Enlightened have an impressive array of defences, how long will it be before the major factions turn their gaze southwards to take for themselves the secrets of the Vault? AN UNCERTAIN FUTURE After the turbulence of the 1860s the world has entered a period which has come to be known as ‘the Interbellum’ – a time of retrenchment, of consolidation, of detente. But only the naïve and the foolish take this to mean the end of the conflict on the Earth. The Interbellum does not mean peace, but only preparation for yet greater clashes to come! Meet the Dauntless! I got a wild hair last week. It probably will be a shelf queen since I don't see me using it real often. Hi Folks, Here's my start to this project, a squadron of Aquan frigates. Pretty simple paint scheme, with a base of blue and teal, with purple engine parts and red/orange for the weapons. Probably going to do some destroyers next month. Ok, where are we. We literally had all the molds and masters etc chucked into pallet containers. When they arrived with us. When a company enters administration usually it isn't an orderly and organized process. So we had this huge amount of stuff that we have had to work our way through. Including an additional 25 pallets found in another location, that though it had no value, was really an important thing for us to be able to control the disposal of. Then we have had to back up and protect the huge amount of data for the assets. Well over 16TB, that wasn't well protected. So we had to build the local storage solution, then ensure it was backed up and safe whatever happened in transit. Lots of issues with the files... We had to audit them to remove any items related to Halo. Then we have to start looking at SKUs. I know it seems simple to say here is a mold, that must be a single product. But it isn't like that at all. Most of the molds are not labeled in any way. We have mold labels at Warcradle which are actually molded into the mold making process. So we have to identify what constitutes a product then start finding the molds for them. We already have an ERP system at Warcradle to put the data in, but though there was an equivalent on the Spartan kit we acquired, It had been deactivated months before administration due to non-payment so we didn't have access. So building assembly lists for products takes a while. Add to that there being almost no Studio minis present... Despite them being photographed everywhere in packaging and books, and then lots of missing equipment that had managed to vanish between going into administration and us visiting... amazingly it was a selection of equipment that would allow manufacturing of a wide range of products. One of the 3d printers vanishing. The list of frustrations goes on. So since then, we have been building data, assessing molds, getting data into our ERP and expanding production facilities. Had all our creative guys work on design libraries for the games and various factions too. Making our facilities safe etc. For example, we have proper ventilation and air quality infrastructure for casting environments and resin residues are dealt with responsibly. We have proper health and safety plans. As opposed to just chucking out empty resin buckets at the back of the factory like Spartan did. Loads of meetings and investment in how things are going to be arranged moving forwards. It is important that we do things properly. How about we start with a working engine that's quick, fun and allows for decent tactical choices first, so we know what has to be written to make it work background wise? Switch inches for centimetres, third the ranges, double the ranges. You can homebrew whatever you want. All we provide are models, rules and guidelines for consistency when playing new opponents. What you get up to with your friends in the comfort of your dining room is entirely in your hands. Couple more shots of the table nearing completion. I am not an artist in the traditional sense, my wife did the planet and I pretty well spent my day off splashing colours on. Just need some cleanup and topcoat!